Beneath a Buried House by Bob Avey, a Mysterious Review. Review: Tulsa police detective Kenny Elliot finds himself inexorably drawn into strange circumstances surrounding the death of a man from an apparent drug overdose, alone in a nearly vacant apartment, in Beneath a Buried House, the second mystery in this series by Bob Avey. Thought by his peers to be an accidental death or potentially a suicide, Kenny believes the unidentified man was murdered. When a prostitute seen with the man on the night of his death is later killed, Kenny is sure the cases are related though there is no physical evidence to connect them. It isn't until he ties the disappearance of the prime suspect in the murder to the dead man that Kenny realizes the solution to his case may ultimately involve a family that went missing years ago. Beneath a Buried House is one of those mysteries that capture the reader's imagination from the very first chapter. Relationships between many of the characters are established early but are incomplete leading to a sense of foreboding: something is bound to happen but it isn't clear what that may be or when or to whom it may happen. The third person narrative is largely written in a direct, somewhat detached manner that is completely in character with Kenny himself. Even his relationship, really infatuation, with a mysterious woman has a circumspect aspect to it. Towards the end the plot becomes rather predictable, there are a few plot points aren't cleanly wrapped up, and what is undoubtedly intended to be a surprise ending isn't, but overall these are minor criticisms for what is otherwise an enjoyable crime novel. 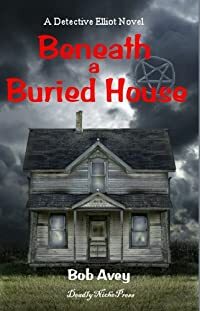 Acknowledgment: Bob Avey provided a copy of Beneath a Buried House for this review.